Imagine waking up feeling refreshed, strong, and vibrant, with your hormones in balance and your body nourished. For the millions who are grappling with numerous autoimmune conditions, this vision appears so distant from the daily reality that it seems an impossibility. 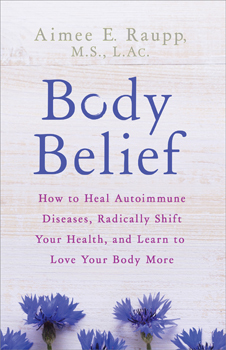 In spite of increasing knowledge and awareness, the causes and effects of autoimmune conditions are often misunderstood, and the connection between inner well-being and physical health is not fully explored. As an acupuncturist and herbalist, Aimee Raupp, has treated a variety of autoimmune conditions, as well as managed her own. Her Body Belief Plan bridges the gap between our internal and external healing to present a holistic and practical approach based on the core pillars of reconnecting to ourselves, renewing our beliefs, and reawakening our health. As you follow Raupp's two-phase Body Belief diet and Body Belief lifestyle road map, your whole self will begin to thrive, both inside and out. Raupp guides you step by step through a 12-week diet plan, weekly Body Belief guide, shopping lists, menus, meditations, mantras, and DIY and commercial suggestions for bath, beauty, and home products for self-care. Raupp explores how our beliefs dictate our behavior, which ultimately dictates our health. Every person deserves to feel good, and everyone is capable of making their optimal self a reality.